The Manhattan Project was a research and development project that produced the first atomic bombs during World War II. It was led by the United States with the support of the United Kingdom and Canada. From 1942 to 1946, the project was under the direction of Major General Leslie Groves of the U.S. Army Corps of Engineers; physicist J. Robert Oppenheimer was the scientific director of the Los Alamos National Laboratory that designed the actual bombs. The Army component of the project was designated the Manhattan District; "Manhattan" gradually superseded the official codename, Development of Substitute Materials, for the entire project. Along the way, the project absorbed its earlier British counterpart, Tube Alloys. The Manhattan Project began modestly in 1939, but grew to employ more than 130,000 people and cost nearly US$2 billion (about $26 billion in 2015 dollars). Over 90% of the cost was for building factories and producing the fissile materials, with less than 10% for development and production of the weapons. Research and production took place at more than 30 sites across the United States, the United Kingdom and Canada. 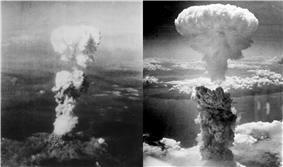 Two types of atomic bomb were developed during the war. A relatively simple gun-type fission weapon was made using uranium-235, an isotope that makes up only 0.7 percent of natural uranium. Since it is chemically identical to the most common isotope, uranium-238, and has almost the same mass, it proved difficult to separate. Three methods were employed for uranium enrichment: electromagnetic, gaseous and thermal. Most of this work was performed at Oak Ridge, Tennessee. In parallel with the work on uranium was an effort to produce plutonium. Reactors were constructed at Oak Ridge and Hanford, Washington, in which uranium was irradiated and transmuted into plutonium. The plutonium was then chemically separated from the uranium. The gun-type design proved impractical to use with plutonium so a more complex implosion-type weapon was developed in a concerted design and construction effort at the project's principal research and design laboratory in Los Alamos, New Mexico. 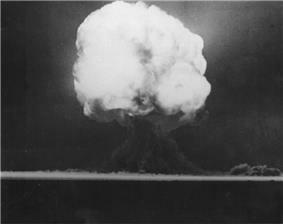 The first nuclear device ever detonated was an implosion-type bomb at the Trinity test, conducted at New Mexico's Alamogordo Bombing and Gunnery Range on 16 July 1945. Little Boy, a gun-type weapon, and Fat Man, an implosion-type weapon, were used in the atomic bombings of Hiroshima and Nagasaki, respectively. 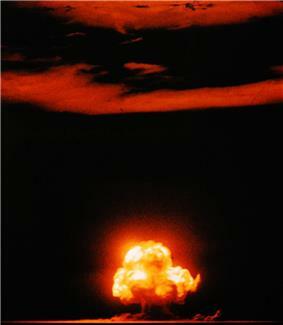 In the immediate postwar years, the Manhattan Project conducted weapons testing at Bikini Atoll as part of Operation Crossroads, developed new weapons, promoted the development of the network of national laboratories, supported medical research into radiology and laid the foundations for the nuclear navy. It maintained control over American atomic weapons research and production until the formation of the United States Atomic Energy Commission in January 1947. In August 1939, prominent physicists Leó Szilárd and Eugene Wigner drafted the Einstein–Szilárd letter, which warned of the potential development of "extremely powerful bombs of a new type". It urged the United States to take steps to acquire stockpiles of uranium ore and accelerate the research of Enrico Fermi and others into nuclear chain reactions. They had it signed by Albert Einstein and delivered to President Franklin D. Roosevelt. Roosevelt called on Lyman Briggs of the National Bureau of Standards to head the Advisory Committee on Uranium to investigate the issues raised by the letter. Briggs held a meeting on 21 October 1939, which was attended by Szilárd, Wigner and Edward Teller. The committee reported back to Roosevelt in November that uranium "would provide a possible source of bombs with a destructiveness vastly greater than anything now known." Briggs proposed that the National Defense Research Committee (NDRC) spend $167,000 on research into uranium, particularly the uranium-235 isotope, and the recently discovered plutonium. On 28 June 1941, Roosevelt signed Executive Order 8807, which created the Office of Scientific Research and Development (OSRD), with Vannevar Bush as its director. The office was empowered to engage in large engineering projects in addition to research. The NDRC Committee on Uranium became the S-1 Uranium Committee of the OSRD; the word "uranium" was soon dropped for security reasons. In Britain, Wabash River Ordnance Works, near Dana and Newport, Indiana; and at the Alabama Ordnance Works, near Childersburg and Sylacauga, Alabama. 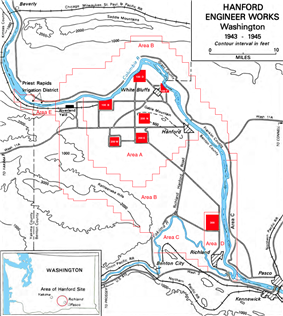 Although known as Ordnance Works and paid for under Ordnance Department contracts, they were built and operated by the Army Corps of Engineers. The American plants used a process different from Trail's; heavy water was extracted by distillation, taking advantage of the slightly higher boiling point of heavy water. The key raw material for the project was uranium, which was used as fuel for the reactors, as feed that was transformed into plutonium, and, in its enriched form, in the atomic bomb itself. There were four known major deposits of uranium in 1940: in Colorado, in northern Canada, in Joachimstal in Czechoslovakia, and in the Belgian Congo. All but Joachimstal were in allied hands. A November 1942 survey determined that sufficient quantities of uranium were available to satisfy the project's requirements. Nichols arranged with the State Department for export controls to be placed on uranium oxide and negotiated for the purchase of 1,200 long tons (1,200 t) of uranium ore from the Belgian Congo that was being stored in a warehouse on Staten Island and the remaining stocks of mined ore stored in the Congo. He negotiated with Eldorado Gold Mines for the purchase of ore from its refinery in Port Hope, Ontario, and its shipment in 100-ton lots. The Canadian government subsequently bought up the company's stock until it acquired a controlling interest. While these purchases assured a sufficient supply to meet wartime needs, the American and British leaders concluded that it was in their countries' interest to gain control of as much of the world's uranium deposits as possible. The richest source of ore was the Shinkolobwe mine in the Belgian Congo, but it was flooded and closed. Nichols unsuccessfully attempted to negotiate its reopening and the sale of the entire future output to the United States with Edgar Sengier, the director of the company that owned the mine, Union Minière du Haut Katanga. The matter was then taken up by the Combined Policy Committee. As 30 percent of Union Minière's stock was controlled by British interests, the British took the lead in negotiations. Sir John Anderson and Ambassador John Winant hammered out a deal with Sengier and the Belgian government in May 1944 for the mine to be reopened and 1,720 long tons (1,750 t) of ore to be purchased at $1.45 a pound. To avoid dependence on the British and Canadians for ore, Groves also arranged for the purchase of US Vanadium Corporation's stockpile in Uravan, Colorado. Uranium mining in Colorado yielded about 800 long tons (810 t) of ore.
Mallinckrodt Incorporated in St. Louis, Missouri, took the raw ore and dissolved it in nitric acid to produce uranyl nitrate. Ether was then added in a liquid–liquid extraction process to separate the impurities from the uranyl nitrate. This was then heated to form uranium trioxide, which was reduced to highly pure uranium dioxide. By July 1942, Mallinckrodt was producing a ton of highly pure oxide a day, but turning this into uranium metal initially proved more difficult for contractors Westinghouse and Metal Hydrides. Production was too slow and quality was unacceptably low. A special branch of the Metallurgical Laboratory was established at Iowa State College in Ames, Iowa, under Frank Spedding to investigate alternatives, and its Ames process became available in 1943. The centrifuge process was regarded as the only promising separation method in April 1942. Jesse Beams had developed such a process at the University of Virginia during the 1930s, but had encountered technical difficulties. The process required high rotational speeds, but at certain speeds harmonic vibrations developed that threatened to tear the machinery apart. It was therefore necessary to accelerate quickly through these speeds. In 1941 he began working with uranium hexafluoride, the only known gaseous compound of uranium, and was able to separate uranium-235. At Columbia, Urey had Cohen investigate the process, and he produced a body of mathematical theory making it possible to design a centrifugal separation unit, which Westinghouse undertook to construct. Electromagnetic isotope separation was developed by Lawrence at the University of California Radiation Laboratory. This method employed devices known as calutrons, a hybrid of the standard laboratory mass spectrometer and cyclotron. The name was derived from the words "California", "university" and "cyclotron". In the electromagnetic process, a magnetic field deflected charged particles according to mass. The process was neither scientifically elegant nor industrially efficient. Compared with a gaseous diffusion plant or a nuclear reactor, an electromagnetic separation plant would consume more scarce materials, require more manpower to operate, and cost more to build. Nonetheless, the process was approved because it was based on proven technology and therefore represented less risk. Moreover, it could be built in stages, and rapidly reach industrial capacity. Marshall and Nichols discovered that the electromagnetic isotope separation process would require 5,000 tons of copper, which was in desperately short supply. However, silver could be substituted, in an 11:10 ratio. On 3 August 1942, Nichols met with Under Secretary of the Treasury Daniel W. Bell and asked for the transfer of 6,000 tons of silver bullion from the West Point Depository. "Young man," Bell told him, "you may think of silver in tons but the Treasury will always think of silver in troy ounces!" Eventually, 14,700 tons were used. Tennessee Eastman was hired to manage Y-12 on the usual cost plus fixed fee basis, with a fee of $22,500 per month plus $7,500 per racetrack for the first seven racetracks and $4,000 per additional racetrack. The calutrons were initially operated by scientists from Berkeley to remove bugs and achieve a reasonable operating rate. They were then turned over to trained Tennessee Eastman operators who had only a high school education. Nichols compared unit production data, and pointed out to Lawrence that the young "hillbilly" girl operators were outperforming his PhDs. They agreed to a production race and Lawrence lost, a morale boost for the Tennessee Eastman workers and supervisors. The girls were "trained like soldiers not to reason why", while "the scientists could not refrain from time-consuming investigation of the cause of even minor fluctuations of the dials." 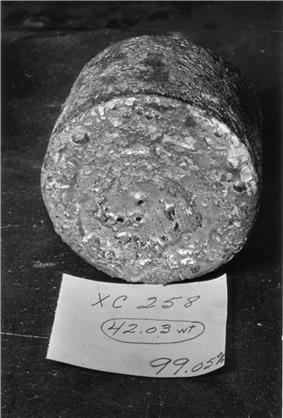 Y-12 initially enriched the uranium-235 content to between 13% and 15%, and shipped the first few hundred grams of this to Los Alamos in March 1944. Only 1 part in 5,825 of the uranium feed emerged as final product. Much of the rest was splattered over equipment in the process. 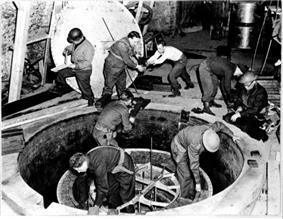 Strenuous recovery efforts helped raise production to 10% of the uranium-235 feed by January 1945. In February the Alpha racetracks began receiving slightly enriched (1.4%) feed from the new S-50 thermal diffusion plant. The next month it received enhanced (5%) feed from the K-25 gaseous diffusion plant. By April K-25 was producing uranium sufficiently enriched to feed directly into the Beta tracks. The most promising but also the most challenging method of isotope separation was gaseous diffusion. Graham's law states that the rate of effusion of a gas is inversely proportional to the square root of its molecular mass, so in a box containing a semi-permeable membrane and a mixture of two gases, the lighter molecules will pass out of the container more rapidly than the heavier molecules. The gas leaving the container is somewhat enriched in the lighter molecules, while the residual gas is somewhat depleted. The idea was that such boxes could be formed into a cascade of pumps and membranes, with each successive stage containing a slightly more enriched mixture. Research into the process was carried out at Columbia University by a group that included Harold Urey, Karl P. Cohen and John R. Dunning. In November 1942 the Military Policy Committee approved the construction of a 600-stage gaseous diffusion plant. 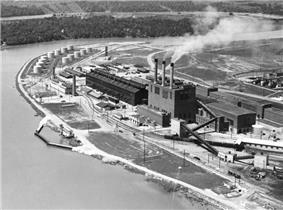 On 14 December, M. W. Kellogg accepted an offer to construct the plant, which was codenamed K-25. A cost plus fixed fee contract was negotiated, eventually totaling $2.5 million. A separate corporate entity called Kellex was created for the project, headed by Percival C. Keith, one of Kellogg's vice presidents. The process faced formidable technical difficulties. The highly corrosive gas uranium hexafluoride would have to be used, as no substitute could be found, and the motors and pumps would have to be vacuum tight and enclosed in inert gas. The biggest problem was the design of the barrier, which would have to be strong, porous and resistant to corrosion by uranium hexafluoride. The best choice for this seemed to be nickel. Edward Adler and Edward Norris created a mesh barrier from electroplated nickel. A six-stage pilot plant was built at Columbia to test the process, but the Norris-Adler prototype proved to be too brittle. A rival barrier was developed from powdered nickel by Kellex, the Bell Telephone Laboratories and the Bakelite Corporation. In January 1944, Groves ordered the Kellex barrier into production. The thermal diffusion process was based on Sydney Chapman and David Enskog's theory, which explained that when a mixed gas passes through a temperature gradient, the heavier one tends to concentrate at the cold end and the lighter one at the warm end. Since hot gases tend to rise and cool ones tend to fall, this can be used as a means of isotope separation. This process was first demonstrated by H. Clusius and G. Dickel in Germany in 1938. It was developed by US Navy scientists, but was not one of the enrichment technologies initially selected for use in the Manhattan Project. This was primarily due to doubts about its technical feasibility, but the inter-service rivalry between the Army and Navy also played a part. The Naval Research Laboratory continued the research under Philip Abelson's direction, but there was little contact with the Manhattan Project until April 1944, when Captain William S. Parsons, the naval officer who was in charge of ordnance development at Los Alamos, brought Oppenheimer news of encouraging progress in the Navy's experiments on thermal diffusion. Oppenheimer wrote to Groves suggesting that the output of a thermal diffusion plant could be fed into Y-12. Groves set up a committee consisting of Warren K. Lewis, Eger Murphree and Richard Tolman to investigate the idea, and they estimated that a thermal diffusion plant costing $3.5 million could enrich 50 kilograms (110 lb) of uranium per week to nearly 0.9% uranium-235. Groves approved its construction on 24 June 1944. Groves contracted with the H. K. Ferguson Company of Cleveland, Ohio, to build the thermal diffusion plant, which was designated S-50. Groves' advisers, Karl Cohen and W. I. Thompson from Standard Oil, estimated that it would take six months to build. Groves gave Ferguson just four. Plans called for the installation of 2,142 48-foot-tall (15 m) diffusion columns arranged in 21 racks. Inside each column were three concentric tubes. Steam, obtained from the nearby K-25 powerhouse at a pressure of 100 pounds per square inch (690 kPa) and temperature of 545 °F (285 °C), flowed downward through the innermost 1.25-inch (32 mm) nickel pipe, while water at 155 °F (68 °C) flowed upward through the outermost iron pipe. Isotope separation occurred in the uranium hexafluoride gas between the nickel and copper pipes. 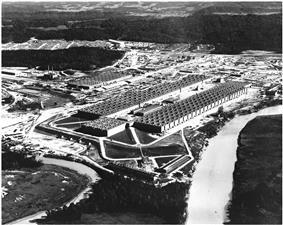 In March 1943, DuPont began construction of a plutonium plant on a 112-acre (0.5 km2) site at Oak Ridge. 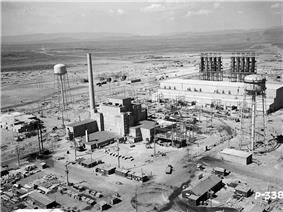 Intended as a pilot plant for the larger production facilities at Hanford, it included the air-cooled X-10 Graphite Reactor, a chemical separation plant, and support facilities. Because of the subsequent decision to construct water-cooled reactors at Hanford, only the chemical separation plant operated as a true pilot. The X-10 Graphite Reactor consisted of a huge block of graphite, 24 feet (7.3 m) long on each side, weighing around 1,500 long tons (1,500 t), surrounded by 7 feet (2.1 m) of high-density concrete as a radiation shield. The greatest difficulty was encountered with the uranium slugs produced by Mallinckrodt and Metal Hydrides. These somehow had to be coated in aluminum to avoid corrosion and the escape of fission products into the cooling system. The Grasselli Chemical Company attempted to develop a hot dipping process without success. Meanwhile Alcoa tried canning. A new process for flux-less welding was developed, and 97% of the cans passed a standard vacuum test, but high temperature tests indicated a failure rate of more than 50%. Nonetheless, production began in June 1943. The Metallurgical Laboratory eventually developed an improved welding technique with the help of General Electric, which was incorporated into the production process in October 1943. 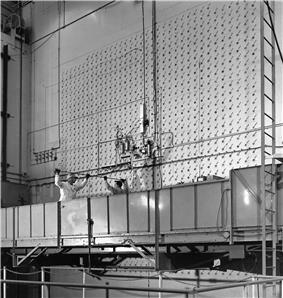 Watched by Fermi and Compton, the X-10 Graphite Reactor went critical on 4 November 1943 with about 30 long tons (30 t) of uranium. A week later the load was increased to 36 long tons (37 t), raising its power generation to 500 kW, and by the end of the month the first 500 milligrams (0.018 oz) of plutonium was created. Modifications over time raised the power to 4,000 kW in July 1944. X-10 operated as a production plant until January 1945, when it was turned over to research activities. 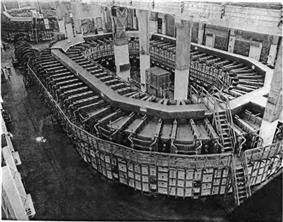 Work began on Reactor B, the first of six planned 250 MW reactors, on 10 October 1943. The reactor complexes were given letter designations A through F, with B, D and F sites chosen to be developed first, as this maximised the distance between the reactors. They would be the only ones constructed during the Manhattan Project. Some 390 long tons (400 t) of steel, 17,400 cubic yards (13,300 m3) of concrete, 50,000 concrete blocks and 71,000 concrete bricks were used to construct the 120-foot (37 m) high building. "U.S. Department of Energy, OSTI, R&D Accomplishments: The Manhattan Project". Retrieved 8 May 2013. "U.S. Department of Energy, OSTI, R&D Accomplishments: The Manhattan Project—Its Story: Background, Establishment, Operations, Immediate Influences, and Long-term Influences". Retrieved 8 May 2013. Project "Alsos Digital Library for Nuclear Issues". Washington and Lee University. Retrieved 10 August 2011. "The Atomic Bomb and the End of World War II, A Collection of Primary Sources". "History Center: Los Alamos National Laboratory". "History of Oak Ridge National Laboratory". The Manhattan Project Talks are available for research use at the Gustavus Adolphus College and Lutheran Church Archives. Campbell, Richard H. (2005). The Silverplate Bombers: A History and Registry of the Enola Gay and Other B-29s Configured to Carry Atomic Bombs. Jefferson, North Carolina: McFarland & Company. Fine, Lenore; Remington, Jesse A. (1972). The Corps of Engineers: Construction in the United States. Washington, D.C.: United States Army Center of Military History. Gilbert, Keith V. (1969). History of the Dayton Project. Miamisburg, Ohio: Mound Laboratory, Atomic Energy Commission. Gosling, Francis George (1994). The Manhattan Project: Making the Atomic Bomb. Washington, DC: United States Department of Energy, History Division. Grodzins, Morton; Rabinowitch, Eugene, eds. (1963). The Atomic Age: Scientists in National and World Affairs. New York: Basic Book Publishing. Hewlett, Richard G.; Duncan, Francis (1969). Atomic Shield, 1947–1952. A History of the United States Atomic Energy Commission. University Park: Pennsylvania State University Press. Holloway, David (1994). Stalin and the Bomb: The Soviet Union and Atomic Energy, 1939–1956. New Haven, Connecticut: Yale University Press. Howes, Ruth H.; Herzenberg, Caroline L. (1999). 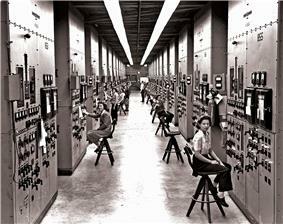 Their Day in the Sun: Women of the Manhattan Project. Philadelphia: Temple University Press. Hunner, Jon (2004). Inventing Los Alamos: The Growth of an Atomic Community. Norman: University of Oklahoma Press. Johnson, Charles; Jackson, Charles (1981). City Behind a Fence: Oak Ridge, Tennessee, 1942–1946. Knoxville: University of Tennessee Press. Stacey, C. P. (1970). Arms, Men and Government: The War Policies of Canada, 1939 – 1945. The Queen's Printer by authority of the Minister of National Defence. Sweeney, Michael S. (2001). Secrets of Victory: The Office of Censorship and the American Press and Radio in World War II. Chapel Hill: University of North Carolina Press. Villa, Brian L. (1981). "Chapter 11: Alliance Politics and Atomic Collaboration, 1941–1943". In Sidney, Aster. The Second World War as a National Experience: Canada. The Canadian Committee for the History of the Second World War, Department of National Defence. Retrieved 8 December 2014. Ahnfeldt, Arnold Lorentz, ed. (1966). Radiology in World War II. Washington, D.C.: Office of the Surgeon General, Department of the Army. Baker, Richard D.; Hecker, Siegfried S.; Harbur, Delbert R. (1983). Plutonium: A Wartime Nightmare but a Metallurgist's Dream. 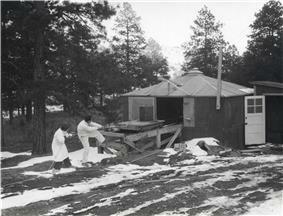 Los Alamos Science (Winter/Spring) (Los Alamos National Laboratory). pp. 142–151. Retrieved 22 November 2010. Hanford Cultural and Historic Resources Program, U.S. Department of Energy (2002). History of the Plutonium Production Facilities, 1943–1990. Richland, Washington: Hanford Site Historic District. Hansen, Chuck (1995b). Volume V: US Nuclear Weapons Histories. Swords of Armageddon: US Nuclear Weapons Development since 1945. Sunnyvale, California: Chukelea Publications. Hawkins, David; Truslow, Edith C.; Smith, Ralph Carlisle (1961). 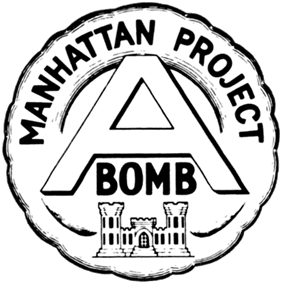 Manhattan District history, Project Y, the Los Alamos story. Los Angeles: Tomash Publishers. Hoddeson, Lillian; Henriksen, Paul W.; Meade, Roger A.; Westfall, Catherine L. (1993). Critical Assembly: A Technical History of Los Alamos During the Oppenheimer Years, 1943–1945. New York: Cambridge University Press. Ruhoff, John; Fain, Pat (June 1962). The First Fifty Critical days. Mallinckrodt Uranium Division News. Vol. 7 (Nos 3 and 4) (St. Louis: Mallinckrodt Incorporated). Retrieved 30 October 2010. Thayer, Harry (1996). Management of the Hanford Engineer Works In World War II: How the Corps, DuPont and the Metallurgical Laboratory Fast Tracked the Original Plutonium Works. New York: American Society of Civil Engineers Press. Waltham, Chris (20 June 2002). An Early History of Heavy Water. Department of Physics and Astronomy, University of British Columbia. Retrieved 30 October 2010. ^ a b c d Consumer Price Index (estimate) 1800–2014. Federal Reserve Bank of Minneapolis. Retrieved 27 February 2014. ^ "Executive Order 8807 Establishing the Office of Scientific Research and Development". 28 June 1941. Retrieved 28 June 2011. .
^ Hoddeson et al. 1993, pp. 42–44. ^ Hoddeson et al. 1993, pp. 54–56. ^ Hoddeson et al. 1993, pp. 44–45. ^ Broad, William J. (30 October 2007). "Why They Called It the Manhattan Project". ^ a b c d Fakley, Dennis C. (Winter–Spring 1983). "The British Mission". Los Alamos Science (7): 186–189. ^ Bernstein 1976, pp. 213. ^ "Oak Ridge National Laboratory Review, Vol. 25, Nos. 3 and 4, 2002". ornl.gov. Retrieved 9 March 2010. ^ "Secretary of Agriculture granting use of land for Demolition Range". Los Alamos National Laboratory. 8 April 1943. Retrieved 6 April 2011. ^ a b "Site A/Plot M, Illinois, Decommissioned Reactor Site Fact Sheet". Retrieved 3 December 2012. ^ "FRONTIERS Research Highlights 1946–1996". Officeof PublicAffairs, ArgonneNational Laboratory. p. 11. Retrieved 23 March 2013. ^ Walsh, John (19 June 1981). "A Manhattan Project Postscript". Science (AAAS) 212 (4501): 1369–1371. ^ "CP-1 (Chicago Pile 1 Reactor)". Argonne National Laboratory. U.S. Department of Energy. Retrieved 12 April 2013. ^ Hoddeson et al. 1993, p. 31. ^ Hewlett & Anderson 1962, pp. 30–32, 96–98. ^ Hanford Cultural and Historic Resources Program 2002, p. 1.16. ^ Hanford Cultural and Historic Resources Program 2002, pp. 2–4.15-2-4.18. ^ Hoddeson et al. 1993, pp. 226–229. ^ Hoddeson et al. 1993, pp. 242–244. ^ Hoddeson et al. 1993, pp. 130–131. ^ Hoddeson et al. 1993, pp. 245–248. ^ Hoddeson et al. 1993, p. 245. ^ a b Hoddeson et al. 1993, pp. 294–296. ^ Hoddeson et al. 1993, p. 299. ^ Hoddeson et al. 1993, pp. 301–307. ^ Hoddeson et al. 1993, pp. 148–154. ^ Baker, Hecker & Harbur 1983, pp. 144–145. ^ Hoddeson et al. 1993, p. 288. ^ Hoddeson et al. 1993, p. 290. ^ Hoddeson et al. 1993, pp. 330–331. ^ Hoddeson et al. 1993, pp. 174–175. ^ Hoddeson et al. 1993, pp. 365–367. ^ Hoddeson et al. 1993, pp. 360–362. ^ Hoddeson et al. 1993, pp. 367–370. ^ Hoddeson et al. 1993, pp. 372–374. ^ "The Secret City / Calutron operators at their panels, in the Y-12 plant at Oak Ridge, Tennessee, during World War II.". The Atlantic. 25 June 2012. Retrieved 25 June 2012. ^ a b c d Wellerstein, Alex (16 April 2012). "Oak Ridge Confidential, or Baseball for Bombs". Restricted Data. Retrieved 7 April 2013. ^ Warren, Cecil (7 August 1945). "Atomic Bomb Secrecy Related By Ex-Worker". The Miami News. pp. 1–A. Retrieved 22 August 2013. ^ a b "No News Leaked Out About Bomb". Lawrence Journal-World. Associated Press. 1945-08-08. p. 5. Retrieved April 15, 2012. ^ Broad, William J. (12 November 2007). "A Spy's Path: Iowa to A-Bomb to Kremlin Honor". ^ Hoddeson et al. 1993, pp. 380–381. ^ Hoddeson et al. 1993, pp. 379–380. ^ Hoddeson et al. 1993, pp. 386–388. ^ Hoddeson et al. 1993, pp. 392–393. ^ "U.S. Strategic Bombing Survey: The Effects of the Atomic Bombings of Hiroshima and Nagasaki". ^ a b Hoddeson et al. 1993, pp. 396–397. ^ "The Atomic Bomb and the End of World War II, A Collection of Primary Sources". National Security Archive Electronic Briefing Book No. 162. ^ Nichols 1987, pp. 215–216. ^ July 1945&documentid=79&studycollectionid=abomb&pagenumber=1 "Petition to the President of the United States, 17 July 1945. Miscellaneous Historical Documents Collection". ^ Hewlett & Anderson 1962, pp. 630, 646. ^ Hewlett & Duncan 1969, pp. 490–493, 514–515. 2He (alpha particle) + 17.7 MeV. The wartime Manhattan Project left a legacy in the form of the network of national laboratories: the Lawrence Berkeley National Laboratory, Los Alamos National Laboratory, Oak Ridge National Laboratory, Argonne National Laboratory and Ames Laboratory. Two more were established by Groves soon after the war, the Brookhaven National Laboratory at Upton, New York, and the Sandia National Laboratories at Albuquerque, New Mexico. Groves allocated $72 million to them for research activities in fiscal year 1946–1947. They would be in the vanguard of the kind of large-scale research that Alvin Weinberg, the director of the Oak Ridge National Laboratory, would call Big Science. A total of four weapons (the Trinity gadget, Little Boy, Fat Man, and an unused bomb) were produced by the end of 1945, making the average cost per bomb around $500 million in 1945 dollars. By comparison, the project's total cost by the end of 1945 was about 90% of the total spent on the production of US small arms (not including ammunition) and 34% of the total spent on US tanks during the same period. Following a domestic debate over the permanent management of the nuclear program, the United States Atomic Energy Commission (AEC) was created by the Atomic Energy Act of 1946 to take over the functions and assets of the Manhattan Project. It established civilian control over atomic development, and separated the development, production and control of atomic weapons from the military. 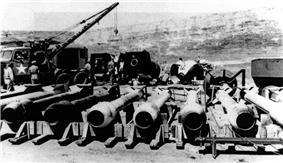 Military aspects were taken over by the Armed Forces Special Weapons Project (AFSWP). Although the Manhattan Project ceased to exist on 31 December 1946, the Manhattan District would remain until it too was abolished on 15 August 1947. 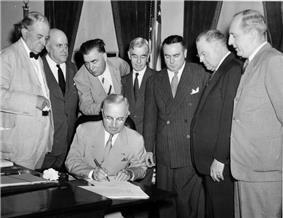 President Harry S. Truman signs the Atomic Energy Act of 1946 establishing the United States Atomic Energy Commission. At Hanford, plutonium production fell off as Reactors B, D and F wore out, "poisoned" by fission products and swelling of the graphite moderator known as the Wigner effect. 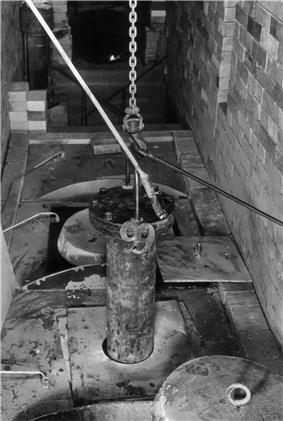 The swelling damaged the charging tubes where the uranium was irradiated to produce plutonium, rendering them unusable. In order to maintain the supply of polonium for the urchin initiators, production was curtailed and the oldest unit, B pile, was closed down so at least one reactor would be available in the future. 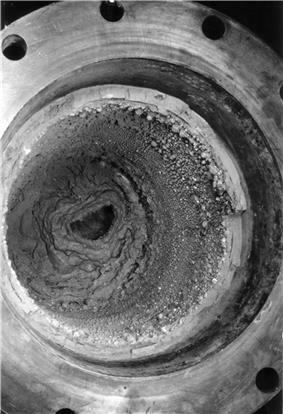 Research continued, with DuPont and the Metallurgical Laboratory developing a redox solvent extraction process as an alternative plutonium extraction technique to the bismuth phosphate process, which left unspent uranium in a state from which it could not easily be recovered. Seeing the work they had not understood produce the Hiroshima and Nagasaki bombs amazed the workers of the Manhattan Project as much as the rest of the world; newspapers in Oak Ridge announcing the Hiroshima bomb sold for $1 ($13 today). In anticipation of the bombings, Groves had Henry DeWolf Smyth prepare a history for public consumption. Atomic Energy for Military Purposes, better known as the "Smyth Report", was released to the public on 12 August 1945. Groves and Nichols presented Army–Navy "E" Awards to key contractors, whose involvement had hitherto been secret. Over 20 awards of the Presidential Medal for Merit were made to key contractors and scientists, including Bush and Oppenheimer. Military personnel received the Legion of Merit, including the commander of the Women's Army Corps detachment, Captain Arlene G. Scheidenhelm. Groves expected to have another atomic bomb ready for use on 19 August, with three more in September and a further three in October. Two more Fat Man assemblies were readied. The Geiger counters arrived in Hiroshima on 8 September headed by Farrell and Warren, with Japanese Rear Admiral Masao Tsuzuki, who acted as a translator. They remained in Hiroshima until 14 September and then surveyed Nagasaki from 19 September to 8 October. This and other scientific missions to Japan would provide valuable scientific and historical data. On the morning of 9 August 1945, the B-29 Bockscar, piloted by the 393d Bombardment Squadron's commander, Major Charles W. Sweeney, lifted off with a Fat Man on board. This time, Ashworth served as weaponeer and Kokura was the primary target. Sweeney took off with the weapon already armed but with the electrical safety plugs still engaged. When they reached Kokura, they found cloud cover had obscured the city, prohibiting the visual attack required by orders. After three runs over the city, and with fuel running low, they headed for the secondary target, Nagasaki. Ashworth decided that a radar approach would be used if the target was obscured, but a last-minute break in the clouds over Nagasaki allowed a visual approach as ordered. The Fat Man was dropped over the city's industrial valley midway between the Mitsubishi Steel and Arms Works in the south and the Mitsubishi-Urakami Ordnance Works in the north. 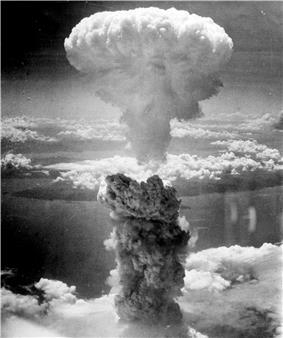 The resulting explosion had a blast yield equivalent to 21 kilotons of TNT, roughly the same as the Trinity blast, but was confined to the Urakami Valley, and a major portion of the city was protected by the intervening hills, resulting in the destruction of about 44% of the city. The bombing also crippled the city's industrial production extensively and killed 23,200-28,200 Japanese industrial workers and 150 Japanese soldiers. Overall, an estimated 35,000-40,000 people were killed and 60,000 injured. On 6 August 1945, the 393d Bombardment Squadron B-29 Enola Gay, piloted and commanded by Tibbets, lifted off with Parsons on board as weaponeer, and Little Boy in its bomb bay. Hiroshima, the headquarters of the 2nd General Army and Fifth Division and a port of embarkation, was the primary target of the mission, with Kokura and Nagasaki as alternatives. With Farrell's permission, Parsons completed the bomb assembly in the air to minimize the risks during takeoff. The bomb detonated at an altitude of 1,750 feet (530 m) with a blast that was later estimated to be the equivalent of 13 kilotons of TNT. An area of approximately 4.7 square miles (12 km2) was destroyed. Japanese officials determined that 69% of Hiroshima's buildings were destroyed and another 6–7% damaged. About 70,000 to 80,000 people, of whom 20,000 were soldiers, or some 30% of the population of Hiroshima, were killed immediately, and another 70,000 injured. In May 1945, the New York Life Insurance Company. The Interim Committee in turn established a scientific panel consisting of Arthur Compton, Fermi, Lawrence and Oppenheimer to advise it on scientific issues. In its presentation to the Interim Committee, the scientific panel offered its opinion not just on the likely physical effects of an atomic bomb, but on its probable military and political impact. Most of the components for Little Boy left San Francisco on the cruiser USS Indianapolis on 16 July and arrived on Tinian on 26 July. Four days later the ship was sunk by a Japanese submarine. The remaining components, which included six uranium-235 rings, were delivered by three C-54 Skymasters of the 509th Group's 320th Troop Carrier Squadron. 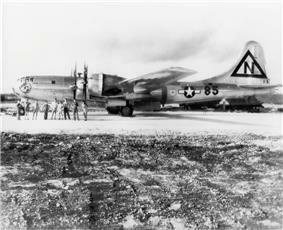 Two Fat Man assemblies travelled to Tinian in specially modified 509th Composite Group B-29s. 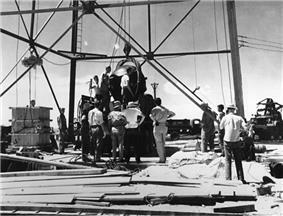 The first plutonium core went in a special C-54. A joint targeting committee of the Manhattan District and USAAF was established to determine which cities in Japan should be targets, and recommended Kokura, Hiroshima, Niigata and Kyoto. At this point, Secretary of War Henry L. Stimson intervened, announcing that he would be making the targeting decision, and that he would not authorize the bombing of Kyoto on the grounds of its historical and religious significance. Groves therefore asked Arnold to remove Kyoto not just from the list of nuclear targets, but from targets for conventional bombing as well. One of Kyoto's substitutes was Nagasaki. The 509th Composite Group was activated on 17 December 1944 at Wendover Army Air Field, Utah, under the command of Colonel Paul W. Tibbets. This base, close to the border with Nevada, was codenamed "Kingman" or "W-47". Training was conducted at Wendover and at Batista Army Airfield, Cuba, where the 393d Bombardment Squadron practiced long-distance flights over water, and dropping dummy pumpkin bombs. 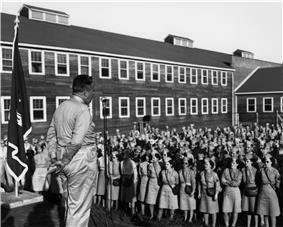 A special unit known as Alberta was formed at Los Alamos under Captain William S. Parsons as part of the Manhattan Project to assist in preparing and delivering the bombs. Commander Frederick L. Ashworth from Alberta met with Fleet Admiral Chester W. Nimitz on Guam in February 1945 to inform him of the project. While he was there, Ashworth selected North Field on the Pacific Island Tinian as a base for the 509th Composite Group, and reserved space for the group and its buildings. The group deployed there in July 1945. 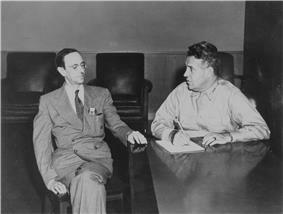 Farrell arrived at Tinian on 30 July as the Manhattan Project representative. Alsos teams rounded up German scientists including Kurt Diebner, Otto Hahn, Walther Gerlach, Werner Heisenberg and Carl Friedrich von Weizsäcker, who were taken to England where they were interned at Farm Hall, a bugged house in Godmanchester. After the bombs were detonated in Japan, the Germans were forced to confront the fact that the Allies had done what they could not. An Alsos team went to Stassfurt in the Soviet Occupation Zone and retrieved 11 tons of ore from WIFO. In April 1945, Pash, in command of a composite force known as T-Force, conducted Operation Harborage, a sweep behind enemy lines of the cities of Hechingen, Bisingen and Haigerloch that were the heart of the German nuclear effort. T-Force captured the nuclear laboratories, documents, equipment and supplies, including heavy water and 1.5 tons of metallic uranium. The Alsos Mission to Italy questioned staff of the physics laboratory at the University of Rome following the capture of the city in June 1944. Meanwhile Pash formed a combined British and American Alsos mission in London under the command of Captain Horace K. Calvert to participate in Operation Overlord. Groves considered the risk that the Germans might attempt to disrupt the Normandy landings with radioactive poisons was sufficient to warn General Dwight D. Eisenhower and send an officer to brief his chief of staff, Lieutenant General Walter Bedell Smith. Under the codename Operation Peppermint, special equipment was prepared and Chemical Warfare Service teams were trained in its use. The most successful Soviet spy was Theodore Hall remained unknown for decades. The value of the espionage is difficult to quantify, as the principal constraint on the Soviet atomic bomb project was a shortage of uranium ore. The consensus is that espionage saved the Soviets one or two years of effort. 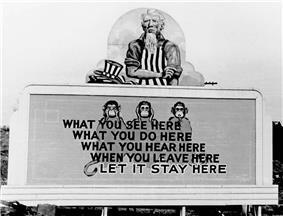 Voluntary censorship of atomic information began before the Manhattan Project. After the start of the European war in 1939 American scientists began avoiding publishing military-related research, and in 1940 scientific journals began asking the Josef Stalin on the absence of articles on nuclear fission in American journals; this resulted in the Soviet Union establishing its own atomic bomb project. 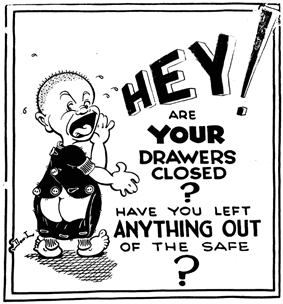 Security poster, warning office workers to close drawers and put documents in safes when not being used. A 1945 Life article estimated that before the Hiroshima and Nagasaki bombings "[p]robably no more than a few dozen men in the entire country knew the full meaning of the Manhattan Project, and perhaps only a thousand others even were aware that work on atoms was involved." The magazine wrote that the more than 100,000 others employed with the project "worked like moles in the dark". Warned that disclosing the project's secrets was punishable by 10 years in prison or a $10,000 ($131,000 today) fine, they saw enormous quantities of raw materials enter factories with nothing coming out, and monitored "dials and switches while behind thick concrete walls mysterious reactions took place" without knowing the purpose of their jobs. At the  Tolman and Conant, in their role as the project's scientific advisers, drew up a list of candidate scientists and had them rated by scientists already working on the project. Groves then sent a personal letter to the head of their university or company asking for them to be released for essential war work. Groves did not relish the prospect of explaining the loss of a billion dollars worth of plutonium to a Senate committee, so a cylindrical containment vessel codenamed "Jumbo" was constructed to recover the active material in the event of a failure. Measuring 25 feet (7.6 m) long and 12 feet (3.7 m) wide, it was fabricated at great expense from 214 long tons (217 t) of iron and steel by Babcock & Wilcox in Barberton, Ohio. Brought in a special railroad car to a siding in Pope, New Mexico, it was transported the last 25 miles (40 km) to the test site on a trailer pulled by two tractors. By the time it arrived, however, confidence in the implosion method was high enough, and the availability of plutonium was sufficient, that Oppenheimer decided not to use it. Instead, it was placed atop a steel tower 800 yards (730 m) from the weapon as a rough measure of how powerful the explosion would be. In the end, Jumbo survived, although its tower did not, adding credence to the belief that Jumbo would have successfully contained a fizzled explosion. Work on an alternative method of bomb design, known as implosion, had begun earlier at the instigation of the physicist Seth Neddermeyer. Implosion used explosives to crush a subcritical sphere of fissile material into a smaller and denser form. When the fissile atoms are packed closer together, the rate of neutron capture increases, and the mass becomes a critical mass. The metal needs to travel only a very short distance, so the critical mass is assembled in much less time than it would take with the gun method. Neddermeyer's 1943 and early 1944 investigations into implosion showed promise, but also made it clear that the problem would be much more difficult from a theoretical and engineering perspective than the gun design. In September 1943, John von Neumann, who had experience with shaped charges used in armor-piercing shells, argued that not only would implosion reduce the danger of predetonation and fizzle, but would make more efficient use of the fissionable material. He proposed using a spherical configuration instead of the cylindrical one that Neddermeyer was working on. Work began on 221-T and 221-U in January 1944, with the former completed in September and the latter in December. The 221-B building followed in March 1945. Because of the high levels of radioactivity involved, all work in the separation plants had to be conducted by remote control using closed-circuit television, something unheard of in 1943. Maintenance was carried out with the aid of an overhead crane and specially designed tools. The 224 buildings were smaller because they had less material to process, and it was less radioactive. The 224-T and 224-U buildings were completed on 8 October 1944, and 224-B followed on 10 February 1945. The purification methods that were eventually used in 231-W were still unknown when construction commenced on 8 April 1944, but the plant was complete and the methods were selected by the end of the year. On 5 February 1945, Matthias hand-delivered the first shipment of 80 grams (2.6 ozt) of 95%-pure plutonium nitrate to a Los Alamos courier in Los Angeles. The Eldorado Mine at Port Radium was a source of uranium ore for the project. The Chalk River, Ontario, site was established to rehouse the Allied effort at the Montreal Laboratory away from an urban area. A new community was built at Deep River, Ontario, to provide residences and facilities for the team members. The site was chosen for its proximity to the industrial manufacturing area of Ontario and Quebec, and proximity to a rail head adjacent to a large military base, Camp Petawawa. Located on the Ottawa River, it had access to abundant water. The first director of the new laboratory was John Cockcroft, later replaced by Bennett Lewis. A pilot reactor known as ZEEP (zero-energy experimental pile) became the first Canadian reactor, and the first to be completed outside the United States, when it went critical in September 1945. A larger 10 MW NRX reactor, which was designed during the war, was completed and went critical in July 1947. The dispute did not delay work. Although progress on the reactor design at Metallurgical Laboratory and DuPont was not sufficiently advanced to accurately predict the scope of the project, a start was made in April 1943 on facilities for an estimated 25,000 workers, half of whom were expected to live on-site. By July 1944, some 1,200 buildings had been erected and nearly 51,000 people were living in the construction camp. As area engineer, Matthias exercised overall control of the site. At its peak, the construction camp was the third most populous town in Washington state. Hanford operated a fleet of over 900 buses, more than the city of Chicago. Like Los Alamos and Oak Ridge, Richland was a gated community with restricted access, but it looked more like a typical wartime American boomtown: the military profile was lower, and physical security elements like high fences, towers and guard dogs were less evident. 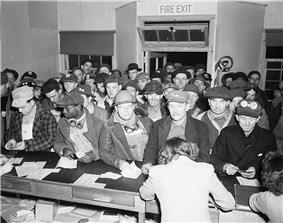 Hanford workers collect their pay checks at the Western Union office. By December 1942 there were concerns that even Oak Ridge was too close to a major population center (Knoxville) in the unlikely event of a major nuclear accident. Groves recruited DuPont in November 1942 to be the prime contractor for the construction of the plutonium production complex. DuPont was offered a standard cost plus fixed fee contract, but the President of the company, Walter S. Carpenter, Jr., wanted no profit of any kind, and asked for the proposed contract to be amended to explicitly exclude the company from acquiring any patent rights. This was accepted, but for legal reasons a nominal fee of one dollar was agreed upon. After the war, DuPont asked to be released from the contract early, and had to return 33 cents. In January 1943, Grafton's successor, Major Arthur V. Peterson, ordered Chicago Pile-1 dismantled and reassembled at Red Gate Woods, as he regarded the operation of a reactor as too hazardous for a densely populated area. After the war, the operations that remained at Red Gate moved to the new Argonne National Laboratory about 6 miles (9.7 km) away. Patterson approved the acquisition of the site on 25 November 1942, authorizing $440,000 for the purchase of the site of 54,000 acres (22,000 ha), all but 8,900 acres (3,600 ha) of which were already owned by the Federal Government. Secretary of Agriculture Claude R. Wickard granted use of some 45,100 acres (18,300 ha) of United States Forest Service land to the War Department "for so long as the military necessity continues". The need for land for a new road, and later for a right of way for a 25-mile (40 km) power line, eventually brought wartime land purchases to 45,737 acres (18,509.1 ha), but only $414,971 was spent. Construction was contracted to the M. M. Sundt Company of Tucson, Arizona, with Willard C. Kruger and Associates of Santa Fe, New Mexico, as architect and engineer. Work commenced in December 1942. Groves initially allocated $300,000 for construction, three times Oppenheimer's estimate, with a planned completion date of 15 March 1943. It soon became clear that the scope of Project Y was greater than expected, and by the time Sundt finished in 30 November 1943, over $7 million had been spent. 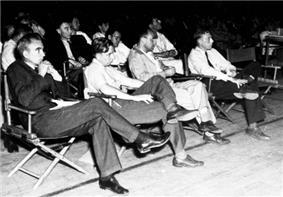 Physicists at a Manhattan District-sponsored colloquium at Los Alamos in 1946. 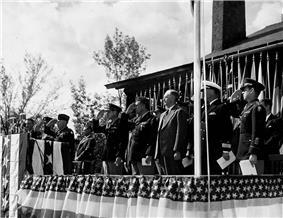 In the front row are (left to right) Norris Bradbury, John Manley, Enrico Fermi and J. M. B. Kellogg. Robert Oppenheimer, in dark coat, is behind Manley; to Oppenheimer's left is Richard Feynman. 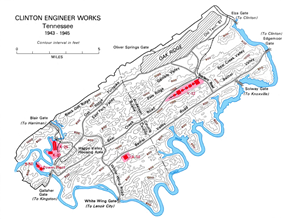 Initially known as the Kingston Demolition Range, the site was officially renamed the Clinton Engineer Works (CEW) in early 1943. While Stone and Webster concentrated on the production facilities, the architectural and engineering firm Skidmore, Owings & Merrill designed and built a residential community for 13,000. The community was located on the slopes of Black Oak Ridge, from which the new town of Oak Ridge got its name. The Army presence at Oak Ridge increased in August 1943 when Nichols replaced Marshall as head of the Manhattan Engineer District. One of his first tasks was to move the district headquarters to Oak Ridge although the name of the district did not change. In September 1943 the administration of community facilities was outsourced to Turner Construction Company through a subsidiary, the Roane-Anderson Company (for Roane and Anderson Counties, in which Oak Ridge was located). Chemical engineers, including William J. Wilcox Jr. and Warren Fuchs, were part of "frantic efforts" to make 10% to 12% enriched uranium 235, known as the code name "tuballoy tetroxide", with tight security and fast approvals for supplies and materials. The population of Oak Ridge soon expanded well beyond the initial plans, and peaked at 75,000 in May 1945, by which time 82,000 people were employed at the Clinton Engineer Works, and 10,000 by Roane-Anderson. Shift change at the Y-12 uranium enrichment facility at Oak Ridge. 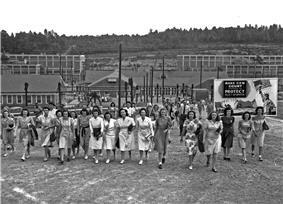 By May 1945, 82,000 people were employed at the Clinton Engineer Works. Groves appreciated the early British atomic research and the British scientists' contributions to the Manhattan Project, but stated that the United States would have succeeded without them. Whether or not he was correct, the British wartime participation was crucial to the success of the United Kingdom's independent nuclear weapons program after the war when the McMahon Act of 1946 temporarily ended American nuclear cooperation. When cooperation resumed after the Quebec agreement, the Americans' progress and expenditures amazed the British. The United States had already spent more than $1 billion ($13,600,000,000 today), while in 1943, the United Kingdom had spent about £0.5 million. Chadwick thus pressed for British involvement in the Manhattan Project to the fullest extent and abandon any hopes of a British project during the war. With Churchill's backing, he attempted to ensure that every request from Groves for assistance was honored. The British Mission that arrived in the United States in December 1943 included Niels Bohr, Otto Frisch, Klaus Fuchs, Rudolf Peierls, and Ernest Titterton. More scientists arrived in early 1944. While those assigned to gaseous diffusion left by the fall of 1944, the 35 working with Lawrence at Berkeley were assigned to existing laboratory groups and stayed until the end of the war. The 19 sent to Los Alamos also joined existing groups, primarily related to implosion and bomb assembly, but not the plutonium-related ones. Part of the Quebec Agreement specified that nuclear weapons would not be used against another country without mutual consent. In June 1945, Wilson agreed that the use of nuclear weapons against Japan would be recorded as a decision of the Combined Policy Committee. The opportunity for an equal partnership no longer existed, however, as shown in August 1942 when the British unsuccessfully demanded substantial control over the project while paying none of the costs. By 1943 the roles of the two countries had reversed from late 1941; in January Conant notified the British that they would no longer receive atomic information except in certain areas. While the British were shocked by the abrogation of the Churchill-Roosevelt agreement, head of the Canadian National Research Council C. J. Mackenzie was less surprised, writing "I can't help feeling that the United Kingdom group [over] emphasizes the importance of their contribution as compared with the Americans." As Conant and Bush told the British, the order came "from the top". The British bargaining position had worsened; the American scientists had decided that the United States no longer needed outside help, and they and others on the bomb policy committee wanted to prevent Britain from being able to build a postwar atomic weapon. The committee supported, and Roosevelt agreed to, restricting the flow of information to what Britain could use during the war—especially not bomb design—even if doing so slowed down the American project. By early 1943 the British stopped sending research and scientists to America, and as a result the Americans stopped all information sharing. The British considered ending the supply of Canadian uranium and heavy water to force the Americans to again share, but Canada needed American supplies to produce them. They investigated the possibility of an independent nuclear program, but determined that it could not be ready in time to affect the outcome of the war in Europe. The British and Americans exchanged nuclear information but did not initially combine their efforts. Britain rebuffed attempts by Bush and Conant in 1941 to strengthen cooperation with its own project, codenamed Tube Alloys, because it was reluctant to share its technological lead and help the United States develop its own atomic bomb. An American scientist who brought a personal letter from Roosevelt to Churchill offering to pay for all research and development in an Anglo-American project was poorly treated, and Churchill did not reply to the letter. The United States as a result decided as early as April 1942 that its offer was rejected, and that it should proceed alone. The United Kingdom did not have the manpower or resources of the United States and despite its early and promising start, Tube Alloys soon fell behind its American counterpart. On 30 July 1942, Sir John Anderson, the minister responsible for Tube Alloys, advised Churchill that: "We must face the fact that ... [our] pioneering work ... is a dwindling asset and that, unless we capitalise it quickly, we shall be outstripped. We now have a real contribution to make to a 'merger.' Soon we shall have little or none." That month Churchill and Roosevelt made an informal, unwritten agreement for atomic collaboration. On 19 September, Groves went to Donald Nelson, the chairman of the War Production Board, and asked for broad authority to issue a AAA rating whenever it was required. Nelson initially balked but quickly caved in when Groves threatened to go to the President. Groves promised not to use the AAA rating unless it was necessary. It soon transpired that for the routine requirements of the project the AAA rating was too high but the AA-3 rating was too low. After a long campaign, Groves finally received AA-1 authority on 1 July 1944. Bush became dissatisfied with Colonel Marshall's failure to get the project moving forward expeditiously, specifically the failure to acquire the Tennessee site, the low priority allocated to the project by the Army and the location of his headquarters in New York City. Bush felt that more aggressive leadership was required, and spoke to Harvey Bundy and Generals Marshall, Somervell, and Styer about his concerns. He wanted the project placed under a senior policy committee, with a prestigious officer, preferably Styer, as overall director. 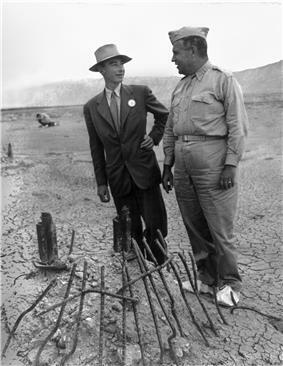 J. Robert Oppenheimer and Leslie Groves at remains of the Trinity test in September 1945. The white overshoes prevent fallout from sticking to the soles of their shoes. Because most of his task involved construction, Marshall worked in cooperation with the head of the Corps of Engineers Construction Division, Major General Thomas M. Robbins, and his deputy, Colonel Leslie Groves. Reybold, Somervell and Styer decided to call the project "Development of Substitute Materials", but Groves felt that this would draw attention. Since engineer districts normally carried the name of the city where they were located, Marshall and Groves agreed to name the Army's component of the project the Manhattan District. This became official on 13 August, when Reybold issued the order creating the new district. Informally, it was known as the Manhattan Engineer District, or MED. Unlike other districts, it had no geographic boundaries, and Marshall had the authority of a division engineer. Development of Substitute Materials remained as the official codename of the project as a whole, but was supplanted over time by "Manhattan". There were still many unknown factors. The properties of pure uranium-235 were relatively unknown, as were those of plutonium, an element that had only been discovered in February 1941 by cyclotrons. Even by December 1943, only two milligrams had been produced. There were many ways of arranging the fissile material into a critical mass. The simplest was shooting a "cylindrical plug" into a sphere of "active material" with a "tamper"—dense material that would focus neutrons inward and keep the reacting mass together to increase its efficiency. They also explored designs involving spheroids, a primitive form of "implosion" suggested by Richard C. Tolman, and the possibility of autocatalytic methods, which would increase the efficiency of the bomb as it exploded. Compton asked the theoretical physicist J. Robert Oppenheimer of the University of California, Berkeley, to take over research into fast neutron calculations—the key to calculations of critical mass and weapon detonation—from Gregory Breit, who had quit on 18 May 1942 because of concerns over lax operational security. John H. Manley, a physicist at the Metallurgical Laboratory, was assigned to assist Oppenheimer by contacting and coordinating experimental physics groups scattered across the country. Oppenheimer and Robert Serber of the University of Illinois examined the problems of neutron diffusion—how neutrons moved in a nuclear chain reaction—and hydrodynamics—how the explosion produced by a chain reaction might behave. To review this work and the general theory of fission reactions, Oppenheimer convened meetings at the University of Chicago in June and at the University of California, Berkeley, in July 1942 with theoretical physicists Hans Bethe, John Van Vleck, Edward Teller, Emil Konopinski, Robert Serber, Stan Frankel, and Eldred C. Nelson, the latter three former students of Oppenheimer, and experimental physicists Felix Bloch, Emilio Segrè, John Manley, and Edwin McMillan. They tentatively confirmed that a fission bomb was theoretically possible. Meanwhile, there were two lines of research into Metallurgical Laboratory in early 1942 to study plutonium and reactors using graphite as a neutron moderator. Briggs, Compton, Lawrence, Murphree, and Urey met on 23 May 1942 to finalize the S-1 Committee recommendations, which called for all five technologies to be pursued. This was approved by Bush, Conant, and Brigadier General Wilhelm D. Styer, the chief of staff of Major General Brehon B. Somervell's Services of Supply, who had been designated the Army's representative on nuclear matters. Bush and Conant then took the recommendation to the Top Policy Group with a budget proposal for $54 million for construction by the United States Army Corps of Engineers, $31 million for research and development by OSRD and $5 million for contingencies in fiscal year 1943. The Top Policy Group in turn sent it to the President on 17 June 1942 and he approved it by writing "OK FDR" on the document. The S-1 Committee held its first meeting on 18 December 1941 "pervaded by an atmosphere of enthusiasm and urgency" in the wake of the attack on Pearl Harbor and the subsequent United States declaration of war upon Japan and then on Germany. Work was proceeding on three different techniques for isotope separation to separate uranium-235 from uranium-238. Lawrence and his team at the University of California, Berkeley, investigated electromagnetic separation, while Eger Murphree and Jesse Wakefield Beams's team looked into gaseous diffusion at Columbia University, and Philip Abelson directed research into thermal diffusion at the Carnegie Institution of Washington and later the Naval Research Laboratory. Murphree was also the head of an unsuccessful separation project using gas centrifuges. At a meeting between President Roosevelt, Vannevar Bush, and Vice President Winston Churchill, suggesting that they correspond on atomic matters.